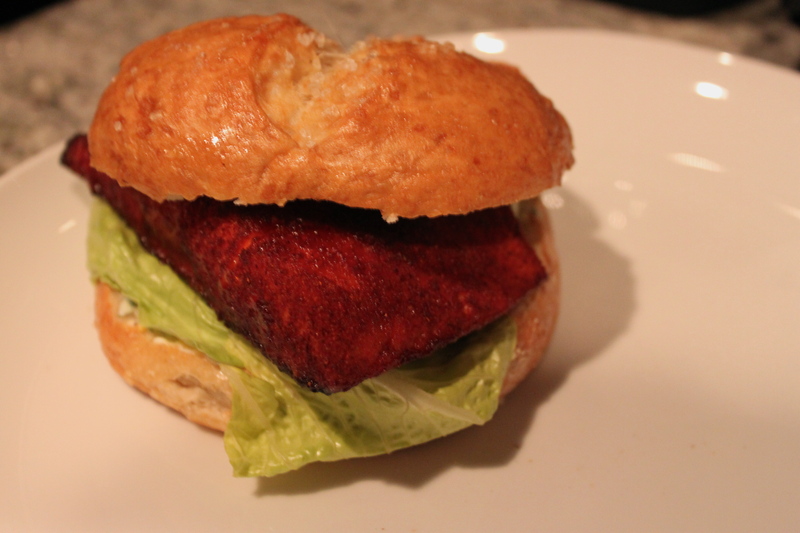 I was inspired by another great blog – Eat, Live Run – to make Sweet and Spicy Salmon Sandwiches with Homemade Pretzel Rolls for my Friday evening guests last weekend. Sometimes there is nothing more fitting than a casual night at home with great homemade sandwiches and fries to kick off the weekend. We stepped up the spices with a trip to Friendly Center’s new Savory Spice Shop and Midtown Olive Press picking up Hungarian Sweet and Spicy Paprika and Chipotle Olive Oil. To accompany the sandwiches we made homemade oven fries dusted with our special paprika and a final toss with Chipotle Olive Oil when they came out of the oven. Super spicy but great dipped in leftover lemon and basil mayo from the sandwiches! I love Eat, Live Run’s simple recipe for Sweet and Spicy Salmon – not only does it taste great but it is really simple to make. I’d make this again and eat on it’s own with a salad or fresh veggies. I used Savory Spice Hungarian Sweet and Spicy Paprika instead of a standard paprika. It certainly kicked up the spice blend making these sandwiches super spicy! We loved the kick (a great cleanse to the sinuses during allergy season!) but be mindful when your putting your spice run together. I made a lemon and basil mayo to go along with the Sweet and Spicy Salmon – it added another fresh layer of flavor to the the sandwich. These sandwiches are huge – so you may want to consider making fewer or splitting them between those who have lighter appetites. They are also great the next day for leftovers right out of the fridge. This is a great treat for a casual evening with family or a fun night with guests! Go for it – tomorrow is FRIDAY! Mix together the chili powder, cumin, brown sugar, paprika and cayenne pepper. Make the Lemon Basil Mayo by mixing a cup of Mayo with the zest and juice of one large lemon, a handful of minced basil and salt and pepper to taste. Set aside for sandwich assembly! Rub the salt on the salmon fillets, followed by the spice mixture. Lay fillets in a pie dish or on a tin foil-lined sheet tray and drizzle the honey over top. Broil fish for 5-8 minutes, until flaky but still pink. Remove from oven and drizzle lemon juice over top. Prepare sandwiches by smearing lemon basil mayonnaise on one side of the pretzel roll, then topping with a salmon fillet. Top with lettuce followed by other half of roll. Serve warm.